Seabirds that forage by plunge diving dive less frequently than those that dive from the water surface, and spend less time in flight than more generalist foragers. We hypothesised that this is due to foraging by plunge diving entailing a high energetic cost, which in turn is due to high energetic costs of take-off and flight. Using heart rate as a proxy for metabolic rate, we evaluated the energetic costs of foraging by plunge diving in the Australasian gannet Morus serrator. As expected, flight entailed a high energetic cost, and energy expenditure during foraging was equivalent to that during flight and significantly higher than that when animals were resting during foraging trips or were inactive on land. These values represent the highest costs of foraging yet recorded in a seabird, and the low frequency of plunge diving can be attributed to these high costs. On average, Australasian gannets perform 2.6 dives h�1when foraging, with a mean dive duration of 3.4 s. As a result, they spend <0.25% of the duration of each foraging trip submerged. We combined this infor- mation with previously obtained data on diet to calculate an estimated rate of prey capture of ~287 g (min submerged)�1. This rate is at least 7 times greater than rates recorded in other diving birds. 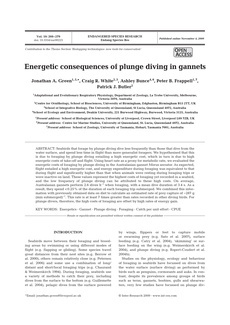 For plunge divers, therefore, the high costs of foraging are offset by high rates of energy gain.